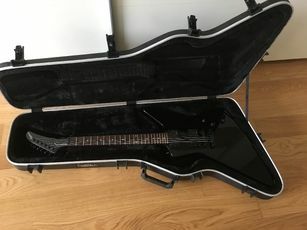 Offer: Epiphone 1984 Explorer Ebony with upgrades and SKB case. 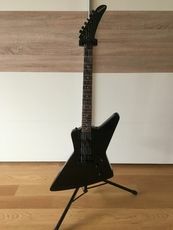 Practically new in pristine condition Epiphone 1984 Explorer Ebony (black gloss) with upgrades. 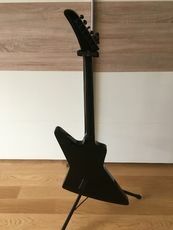 It features mahogany body, mahogany neck, rosewood fretboard (Dalbergia latifolia), 22 frets (628 mm scale length), 2 active humbucker pickups (EMG 81 and EMG 85), Grover tuners. 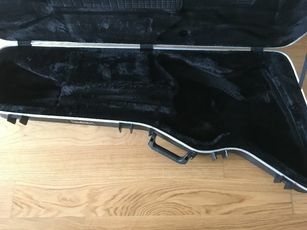 The guitar is just back from a luthier (http://www.viennaguitars.at) where it has had a fret-job and a full setup, so there is no fret buzz, unlike if you buy this guitar new. 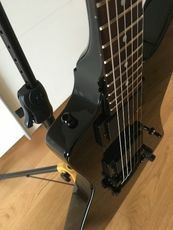 It has had a bridge replaced with TonePros locking Tune-o-matic bridge (the one, which it originally came with was wobbly and didn’t match the radius of the fretboard). Plus, it has Schaller strap locks, so you never risk dropping your guitar. 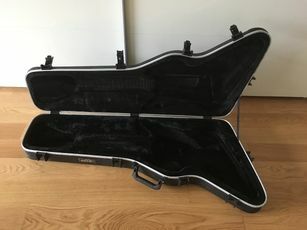 The guitar also comes in an SKB case, which provides full protection to your axe under any circumstances. All of the mentioned goodness (combined value of ca. 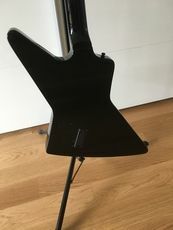 € 1.000) comes at more or less a price of just a guitar, if bought new.